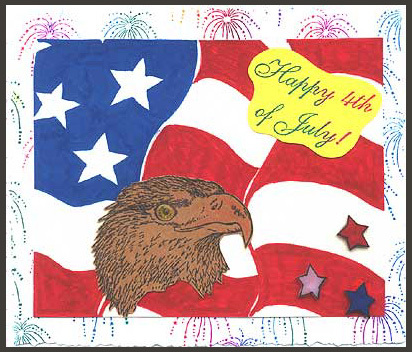 To create the background, “Fireworks” was stamped on white card stock using a Calypso Kaleidacolor stamp pad. “Happy 4th of July!” was stamped on yellow card stock using the same stamp pad. “Eagle’s Head” was stamped on brown paper using a black Memories pad, cut out, the beak colored with pencils and glued to the card. The eye was colored with pencils and Diamond Glaze was added to make it stand out more. 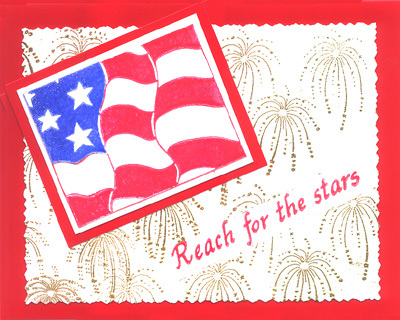 Large stars were drawn onto shrink plastic, colored, shrunk and glued to the card. 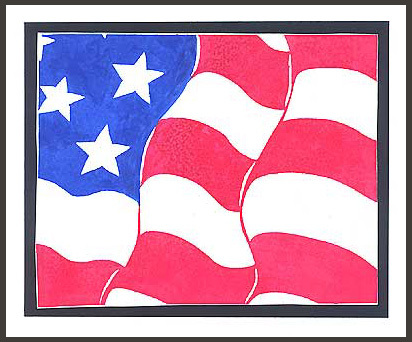 “Furling Flag, Background” was stamped on white paper and colored with markers. Card by Davetta Alexander. This card measures 9 1/2″ x 8″ overall. 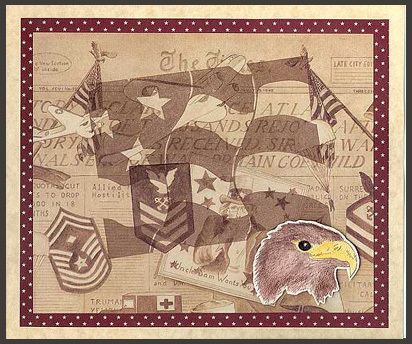 “Furling Flag Background” was stamped in brown Memories ink on scrapbook paper that has military emblems, etc. on it. 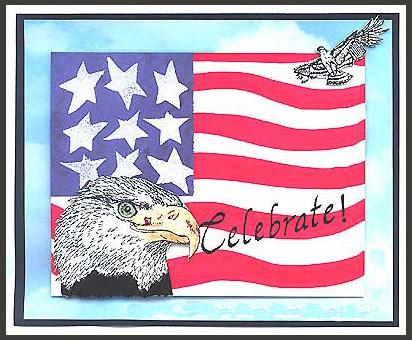 “Eagle’s Head” is stamped on white card stock, colored with pencils, cut out and mounted on foam dots. The military scrapbook paper is layered on dotted burgundy paper and tan parchment. Card by Thalia Sledge. 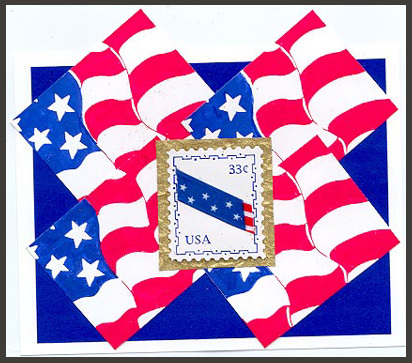 “Furling Flag Background” was stamped by inking the stamp with Brilliance stamp pads in blue and red. The stamp was designed to be able to ink directly to the stamp with a pad and this large stamp does that well. The stamp measures 5 7/8″ x 4 1/2″. Card by Margaret Wiggin. “Eagle’s Head” was stamped in black Memories. It was colored with markers and pencils, cut out and Crystal Lacquer added to the eye. “Eagle, Sm.” was stamped in black and cut out. The flag was made with Marvy markers by drawing wavy red lines on white card stock and “Celebrate!” was stamped in black over it. Hand carved stars were embossed in white on blue card stock which was layered over the stripes. The two eagles were mounted with foam dots. The flag was mounted on “sky and clouds” paper and layered over black and white card stock. Card by Margaret Wiggin. Stamps used are “USA Flag Furling Sm.” and “Frame #21 USA 33 cents.” The flag stamp is inked with Rocket Red and Mediterranean Blue Brilliance pads four times on white card stock, cut out and glued as shown. The faux postage stamp is stamped in blue and cut out. A ribbon is glued diagonally across it and the cut out is glued to gold paper. All are layered as shown on blue and white card stock. Card by Thalia Sledge.